It’s hard to watch someone you love struggle, especially with something as basic as hearing. 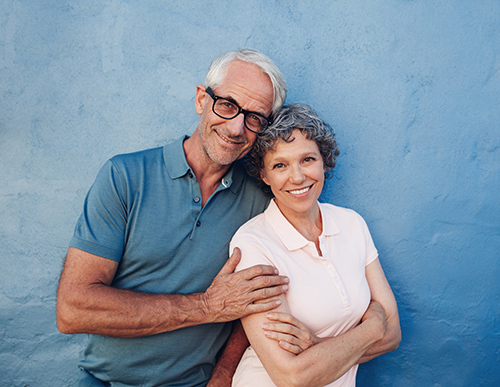 The Hearing Loss Association of America estimates one in every three people over the age of 65 will develop age-related hearing loss – many of them will be husbands with loving wives by their side letting them avoid testing. That leaves the wives with a struggle of their own. How do you get that silly man to a hearing test and maybe to get hearing aids? The ability to talk to one another is the core of a good marriage, but what can you do with the man that doesn’t want to hear about hearing loss? Consider some tips that will get you talking once again. Knowledge is power, so here’s what you need to know about age-related hearing loss. This condition called presbycusis and most people get it eventually. Presbycusis is the wear and tear breakdown of the nerve cells that translate sound into electrical impulses that the brain can interpret. The sound goes into the ear in a wave that moves small hair cells designed to create electrical impulses. Over time, the hair cells stop working well so the brain doesn’t get a clear signal. Not all age-related ear conditions affect the nerves of the inner ear, though. For some, conduction or the movement of sound waves to the inner ear is the problem. Maybe the eardrum or bones in the middle ear wear down. This is why getting an ear exam and a hearing test is a critical step for the proper treatment of hearing loss. Not all forms respond to hearing aids, so an accurate diagnosis is a key to getting him the help he needs. He asks you to repeat what you say often. He hold his hands over his ears when the TV is on or a fan is blowing in the room as if the noise bothers him. His isn’t able to understand conversion in public because there are competing noises in the background such as conversations or cars horns. He tries avoid discussions or ignores ongoing conversations. He acts depressed but you don’t know why. Anyone one of these signs may indicate the onset of hearing loss. There are many ways to approach the subject. You might start with leaving some hearing aid literature around the house and forgetting about it. If he asks, say you were just looking into options for yourself. It’s a good time to mention that you would like to schedule a hearing test, as well, but you think you should get them together. It’s a discreet way to introduce the subject without making it all about his hearing loss. If he says there is nothing wrong with his hearing, point out times when you both struggled with a conversation. Make it clear that there is a problem but you are not sure if it’s you, him or both. If the passive-aggressive approach doesn’t sound right for your relationship, then get direct. Sit down with him and talk about how you feel. Don’t talk about his hearing inadequacies but, instead, how hard it is for you to watch him struggle or how much you miss your long talks. Explain to him, gently, that having to repeat yourself or double and triple check that he heard you is upsetting to you. Focus on his fear of finding out there is a problem, too. Discuss how most people, probably even you, have some hearing loss around this time. It’s completely natural and not a sign of a more serious medical condition. Talk about how easy the hearing test is and how much hearing technology has improved over the last few years. There are hearing aids available the no one can see, ones that work with phones even hearing products that look like Bluetooth devices. No one would have to know he was wearing a hearing aid or he can use it to impress his friends and family his mad tech skills. The most important thing is to let him know he is not alone in this struggle. Offer to get a hearing test of your own and to accompany him to all his appointments. Just having you there by his side may be all it takes to get him on the right track.